Excellence in Aerial Brand Advertising! Cheers Aerial Media began as Cheers Over California, a sole proprietorship in 2001. 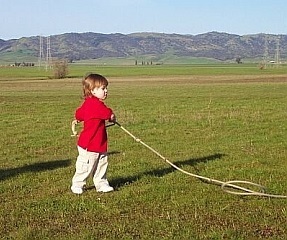 At that time our focus was on hot air balloon rides and special events featuring tethered rides. In 2003, owners David and Shelly Wakefield purchased a new, larger Cheers balloon in order to expand company operations, gaining valuable experience in the industry. 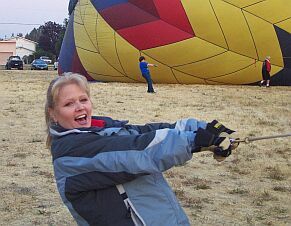 A major turning point for Cheers Over California was in 2005, when Shelly started communications which led to our being hired by RE/MAX to take over their Northern California hot air balloon and inflatable programs, with a territory spanning from Fresno California all the way to the Oregon border. 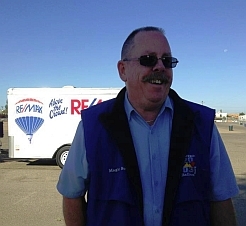 In 2009, David left his 31 year job in the dairy transport industry in order to pursue the business full time and in 2010 Cheers Over California was incorporated as a full time Hot Air Balloon Marketing/Advertising company. Since our inception in 2001, we have flown for clients and at events all over California and in Nevada, Oregon, Arizona and Colorado. 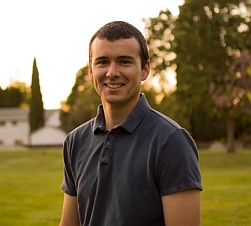 Since 2010, David has served as Pilot Coordinator for the Color the Skies Balloon and Kite Festival in Ripon CA, an annual event benefitting Valley Children's Hospital in Madera, CA. Fulfilling a dream, we expanded into thermal airship advertising in 2014 by travelling to Germany and purchasing a new GEFA-FLUG thermal airship, beginning new operations as Cheers Aerial Media. With this expanded capability we will have even more opportunity to offer excellence to our clients, who deserve nothing less. David has always been fascinated with all things flying and dabbled in the usual things like rockets, radio controlled airplanes and cleaner bag balloons, but never seemed to be able to get the real stuff to happen. 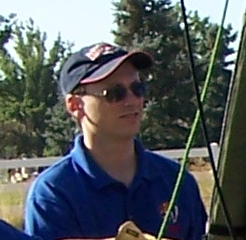 David was first introduced to ballooning in the spring of 1999 when he was asked to crew for a local balloon pilot. He was so captivated that four months later he bought his first balloon, Cheers. For the next year, David worked toward his Private Pilot Certificate, receiving it in July of 2000 after his check ride at Stead Airport in Reno, Nevada. Knowing he'd only just begun, David continued on with his training, receiving his Commercial Pilot Certificate one year later, in July, 2001 with a flight at Prosser Reservoir near Truckee, California. David was introduced to the world of Corporate Ballooning in 1999 when he worked as a crew member for the Lipton Sun Spree Tea balloon. 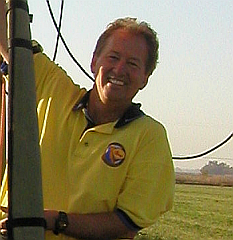 Even as a pilot, David continued working as a crew member on corporate balloons including many special shape balloons and travelling the western United States to various events. Programs included United Van Lines Truck, Energizer Bunny, Bacardi Mixers, Budweiser and many more. David has flown and continues to fly in balloon events in California, Oregon, Nevada, Colorado and Arizona and flying his Cheers Balloon, David has been the sponsored pilot/balloon for Harrah's Reno at the Great Reno Balloon Race since 2003. David also serves as the Pilot Coordinator/Balloonmeister for the Color the Skies Balloon and Kite Festival in Ripon California, a benefit for Valley Children's Hospital in Madera California. 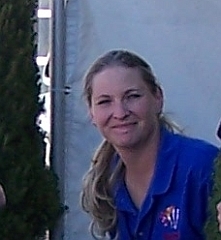 Shelly came to the Cheers family in November of 2000 when she was brought out for her first experience in ballooning by a crew member. Shelly went for her first balloon ride that day and was an immediate hit with the pilot. Dave and Shelly became best friends and were married in the basket of Cheers on August 4th, 2002. Shelly is the driving force behind our marketing and public relations efforts, always looking for opportunities to elevate our clients and make them stand out. Shelly's vision and "chase the dream" attitude is what started the process of our becoming the Northern California RE/MAX balloon program operator in 2005 and pushed Cheers Over California forward with its purchase of our Gefa-Flug airship. 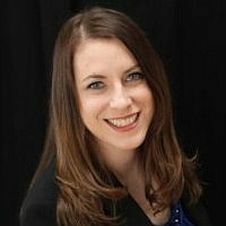 Shelly is constantly looking for new ways to promote "Cheers" and the team through business introductions and creation of media opportunities. 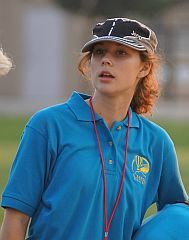 She is also frequently seen with a camera and is responsible for about 99% of the pictures taken for the team, which unfortunately makes it really difficult to get pictures of her. Shelly is a natural "People Person" and loves getting out and meeting new people and giving them the chance to discover the joy of the "ballooning experience." At ballooning events, she can always be found mingling with spectators, showing them how everything works and offering them an opportunity to come over and get involved. If you spot Shelly on the field, make sure to stop and say hello. Arlene got her first taste of ballooning more than 10 years ago as part of a team-building activity at work. It was such an amazing experience, that it left a lasting impression. 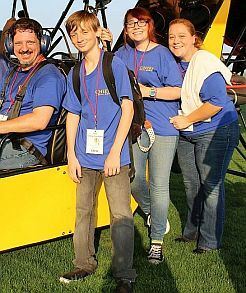 Since then, she's continued to attend and crew at ballooning events throughout California sharing the joy of ballooning with family and friends. What better way to marry a personal passion (ballooning) with a professional one (Marketing and Communications) than by having the amazing and rare opportunity to lead the marketing and communication efforts for an aerial media company? Arlene has been consulting with Cheers Aerial Media for several years, but is thrilled to officially step into a leadership role to help Cheers' clients harness the power of experiential marketing to leave a lasting impression with others and reach and exceed their marketing goals..
Magic Bob (a professional magician and college business instructor) took his first balloon flight in 1997 and it was love at first flight. He started crewing for another pilot and was soon taking flying lessons. He bought his first balloon, "Magic’s Fantasy" in 1998. 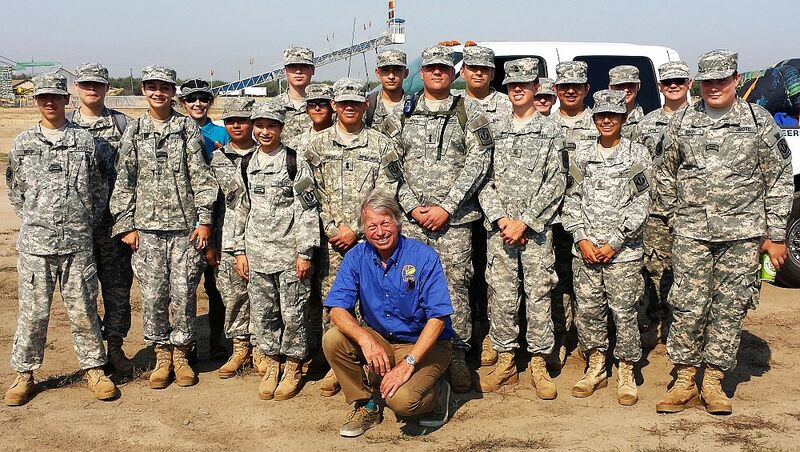 Magic Bob has flown all over the western states and even in Leon, Mexico. He holds a commercial lighter than air pilots certificate and has trained many new pilots. Magic Bob is also the balloonmeister for the Clovis Fest Fun Fly, held each September in Clovis, California. Mike has been captivated by ballooning for nearly 14 years. At the age of 15 he began working at a local hot air balloon repair station certified by the Federal Aviation Administration. He now runs that same business, California Balloon Repair Inc., performing necessary maintenance and inspections on balloons across the West Coast. Mike performs most of the required maintenance on our Cheeers Aerial Media fleet. 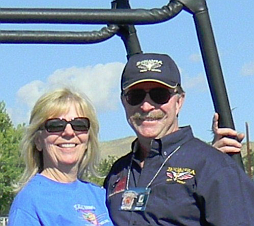 As a Commercially Certified hot air balloon pilot, Michael enjoys providing safe, enjoyable and memorable experiences for each of his passengers. His unique beginnings in ballooning give Michael a level of experience and knowledge unmatched in the industry. Brann Smith is a pilot on our "Amelia Airship" GEFA-FLUG Thermal Airship and has been participating in our airship field operations since day one. Brann has been flying as a commercial hot air balloon pilot since 1999 and has operated balloon companies in Bend, OR, Phoenix, AZ, and Las Vegas, NV and has flying experience in seven West Coast states. Marie Smith is a member of our Thermal Airship team and has been working with us since our first "Amelia Airship" inflation. 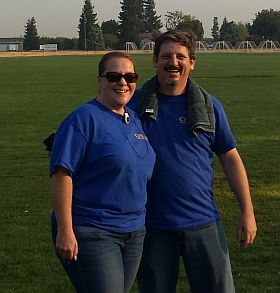 Together, Brann and Marie own Skydancer Balloon Company in Chico California. 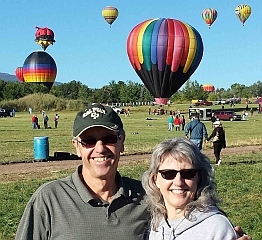 Morrie and Tori live in Boise, ID and travel to events like the Great Reno Balloon Race to be a part of the team. Tori was "literally" the first person to join the team for "Baby Cheers" in 1999. They have also traveled with us to events in Oregon, Colorado, Arizona and throughout Northern California. They also bring their sons, Jacob and Joshua on their trips and they have helped out on the team for many years. We look forward to their newest addition Mason to join the team in a few years. Kaylynn has literally been crewing for the team since she was old enough to walk. She really knows her way around the balloon and knows what needs to be done. Kaylynn has crewed for our Cheers and RE/MAX balloons, various special shapes and is now learning about our thermal airship as well. From Clovis, CA, Kenny, Rachel, Becca and K.C. White have been an integral part of our team since ClovisFest 2014. They have worked with our Cheers Balloon, the RE/MAX Balloon and with our Amelia Airship ever since at events including ClovisFest, Soaring Over Ripon, WHAMOBASS and Tracy Airport Display Day.